The stencil computation frequently appears in scientific computations, where array elements a[i-1] and a[i+1] are referenced to update a[i]. If a[i] is on the boundary area of a distributed array on a node, a[i+1] may reside on another node. Shadow areas can be declared with the shadow directive. In the example below, an array a has shadow areas of size one on both the lower and upper bounds. In the figure above, colored elements are those that each node owns and white ones are shadow. Distributed arrays in a cyclic manner cannot have shadow. For some programs, it is natural that the widths of the shadow area on the lower and upper bounds are different. There is also a case where the shadow area exists only on either of the bounds. In the example below, it is declared that a distributed array a has a shadow area of width one only on the upper bound. The values on the left- and right-hand sides of a colon designate the widths on the lower and upper bounds, respectively. To copy data to shadow areas from neighboring nodes, use the reflect directive. In the example below, an array a having shadow areas of width one on each the upper and lower bounds is reflected. With this reflect directive, in XMP/C, node p sends an element a to the shadow area on the upper bound on node p and a to the shadow area on the lower bound on p; p sends an element a to the shadow area on the lower bound on p, and p sends a to the shadow area on the upper bound on p.
Similarly, in XMP/Fortran, node p(2) sends an element a(5) to the shadow area on the upper bound on node p(1) and a(8) to the shadow area on the lower bound on p(3); p(1) sends an element a(4) to the shadow area on the lower bound on p(2), and p(3) sends a(9) to the shadow area on the upper bound on p(2). The default behavior of a reflect directive is to update the whole of the shadow area declared by a shadow directive. However, there are some cases where a specific part of the shadow area is to be updated to reduce the communication size in a point of the code. To update only a specific part of the shadow area, add the width clause to the reflect directive. The values on the left- and right-hand sides of a colon in the width clause designate the widths on the lower and upper bounds to be updated, respectively. In the example below, only the shadow area on the upper bound is updated. If the widths of the shadow areas to be updated on the upper and lower bounds are equal, that is, for example, width(1:1), you can abbreviate it as width(1). It is not possible to update the shadow area on a particular node. If no shadow area is specified on the lower bound, the reflect directive does not update it with or without a width clause. The below figure illustrates the behavior of a reflect directive for a distributed array a having a shadow area of width one only on the upper bound. The reflect directive does not update either the shadow area on the lower bound on the leading node or that on the upper bound on the last node. However, the values in such areas are needed for stencil computation if the computation needs a periodic boundary condition. To update such areas, add a periodic qualifier into a width clause. Let’s look at the following example where an array a having shadow areas of width one on both the lower and upper bounds appears. 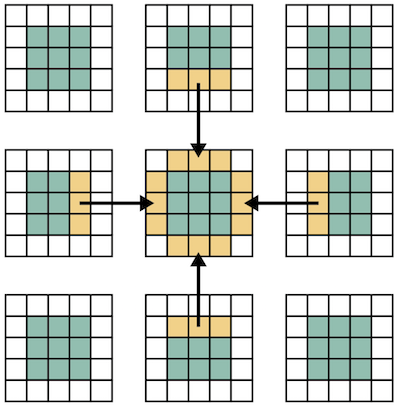 The periodic qualifier has the following effects, in addition to that of a normal reflect directive: in XMP/C, node p sends an element a to the shadow area on the upper bound on node p, and p sends a to the shadow area on the lower bound on p; in XMP/Fortran, node p(1) sends an element a(1) to the shadow area on the upper bound on node p(4), and p(4) sends a(16) to the shadow area on the lower bound on p(1). If the widths of the shadow areas to be updated on the upper and lower bounds are equal, as shown by width(/periodic/1:1) in the above example, you can abbreviate it as width(/periodic/1). 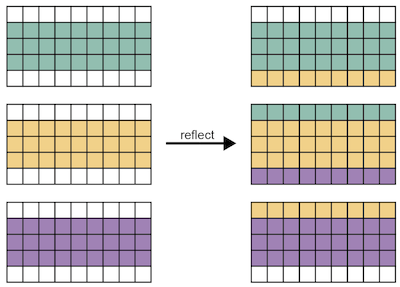 The shadow directive and reflect construct can be applied to distributed arrays multiple dimensions. The following programs are the examples for two-dimensional distribution. 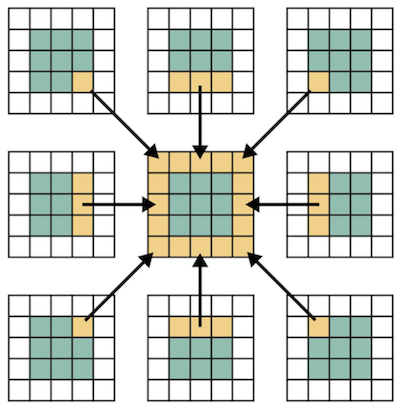 The central node receives the shadow data from the surrounding eight nodes. The shadow areas of the other nodes are also updated, which is omitted in the figure. For some applications, data from ordinal directions are not necessary. In such a case, the data communication from/to the ordinal directions can be avoided by adding an orthogonal clause to a reflect construct. The orthogonal clause is effective only for arrays more than one dimension of which is distributed. Besides, you can also add shadow areas to only specified dimension. In the array specified in the shadow directive, 0 is set as the shadow width in dimensions which are not distributed.